NOTE: The information below is for the 2017 event. The 2018 event will have additional accessibility features, and this page will be updated during March, 2018. By its nature, the event offers opportunities for everyone to participate and join in however they wish. American Sign Language interpretation is available through GGNRA by reservation (at least 5 days in advance). 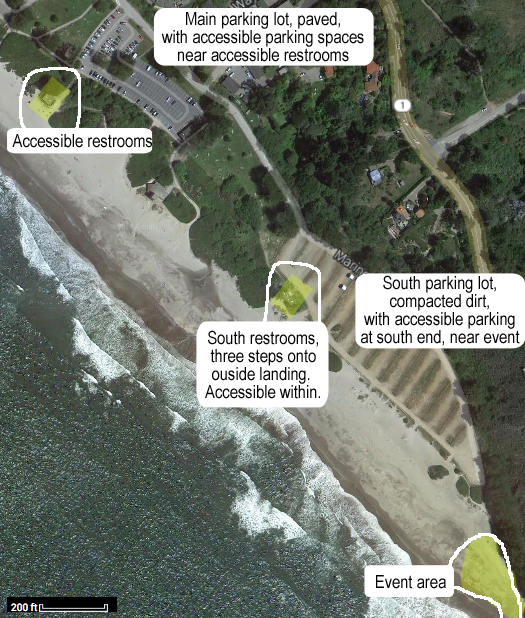 See the Stinson Beach Accessibility web page for general info. The event is located at the extreme south end the beach, near the south parking lot, which will be open for the event. The south parking lot is composed of packed dirt. There are accessible restrooms in the main parking lot, with accessible parking nearby. The south restrooms are accessible inside, but there are three steps up to the landing of the restroom building. Beach wheelchairs are available by reservation (at least 5 days in advance) through GGNRA. See below for diagrams and photos of these features.